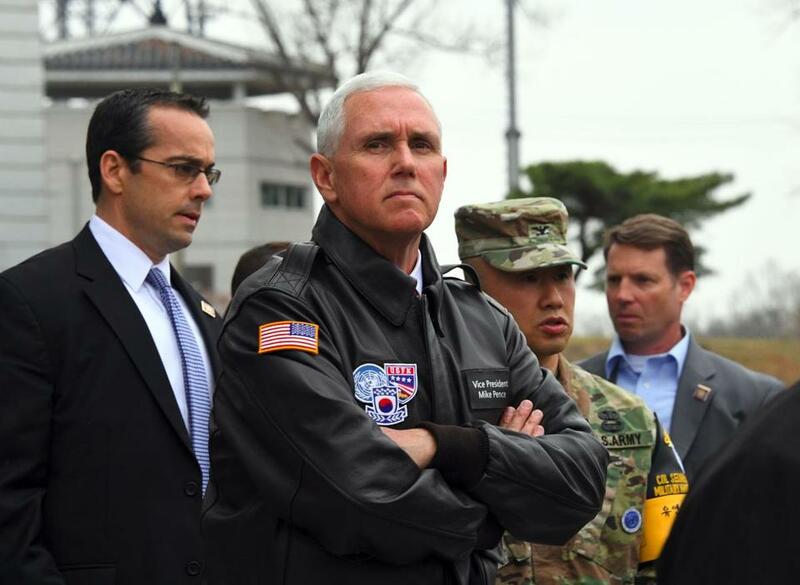 Vice President Mike Pence visited the truce village of Panmunjom in the demilitarized zone on the border between North and South Korea on Monday. With each missile test and each attempt to develop and explode a nuclear device, North Korea is getting closer to joining the nuclear club — and the risk of a thermonuclear conflict breaking out on the Korean peninsula grows greater. Vice President Mike Pence arrived Sunday in the South Korean capital, Seoul, to the audible sounds of relief that, once again, the North’s lack of sophisticated guidance technologies has caused its latest missile test to fail. But he will be mindful that the test — on the 105th anniversary of the birth of the state’s founder, Kim Il Sung — took place despite strong pleas to desist from North Korea’s increasingly frustrated near neighbor, China. China does, however, retain the power to choke North Korea’s vulnerable economy by shutting off oil supplies. This is something that President Trump probably demanded, even as he shared “the most beautiful chocolate cake you have ever seen!” with President Xi last week — while also thoughtfully informing the Chinese leader of a US missile attack on a Syrian airbase, just to ram the point home. It is important to note that although the North Koreans were once again testing a medium-range missile, they have so far not been able to test anything capable of hitting American territory. Still, a nearly completed policy review of America’s options, led by the National Security Council, has looked at a wide range of eventualities, including the possible redeployment of nuclear weapons in South Korea in response to the North’s developing an ability to attack the United States. The combination of the volatility of North Korea’s leader, Kim Jong Un, and the unpredictability of Trump is leading to a game of brinkmanship with far-reaching consequences. Unsurprisingly perhaps, some see Trump’s new muscular foreign policy as a distraction from his troubled domestic agenda. Others believe that North Korea and the United States were always going to reach this stage as long as Pyongyang was forging ahead with its weapons program. 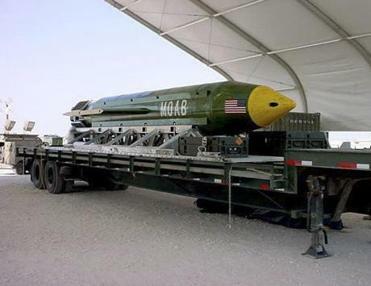 Kim believes that having nuclear weapons, and holding out the possibility of being able to strike at targets as far away as the western United States, not only ensures the survival of his regime but also precludes surgical, preemptive strikes like those against the Syrian airbase or the mountain lair of jihadists in Afghanistan. As the North gets close to weaponizing its nuclear capacity with a viable design that can churn out the 30-plus weapons for which it has fissile material, so does the prospect of a war to end all wars in East Asia. Topography and the ability of the North to level Seoul in a “sea of artillery fire,” potentially incinerating a city of millions, may in the end be Kim’s most powerful means of ensuring his regime’s survival. To that must be added another reality: that the world can never be entirely sure what Pyongyang is testing. As ever, the gap between what is real and what is bluff in the hermetically sealed state that is North Korea is difficult to fathom. Kim’s military, the fourth largest standing army in the world, is fanatical, but its equipment is drawn largely from the Soviet era. His setpiece workers’ paradise capital of Pyongyang could have been constructed as a bizarre film set. The country’s economy, buffeted by successive rounds of United Nations sanctions, barely feeds its people. Sometimes, it does not. It is possible that Trump’s “big stick” approach could have the desired effect over the long run, in particular galvanizing the Chinese and kick-starting a new round of direct negotiations that could eventually lead to the denuclearization of the Korean peninsula. It is also possible that the Chinese may finally tire of Kim Jong Un’s theatrics, switch off the oil, or help engineer a coup in the name of saving the Korean revolution. The United Nations’ new secretary general, António Guterres, and the Security Council face a major challenge, since they are responsible for oversight and maintaining peace along the heavily fortified demilitarized zone. Guterres could reach out to his predecessor at the United Nations, Ban Ki-moon, who, when he was South Korea’s foreign minister, was an architect of the policy of rapprochement between North and South. Ban could play a role in reconvening talks between the regional players — but this time, with the added component of direct talks between the United States and North Korea. The attraction of being remembered as the president who brought a final peace settlement to the Korean peninsula must surely be more tempting to Trump than being one whose bluster and lack of vision hastened the march to a war to end all wars. Mark Seddon is a former speechwriter for UN Secretary General Ban Ki-moon.